Goliad Funeral Home is located at 414 Ward st. in Goliad Texas. 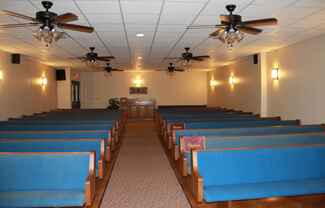 We are dedicated to providing our community and the surrounding areas with dependable and experienced funeral services. We specialize in full-service funeral needs, including traditional funeral services, graveside funeral services, and memorials or celebrations of life services for those families desiring cremation at a reasonable price. We strive continually to be exceptionally prepared and devoted to serving all the people of our community. We are prepared to take care of all your funeral needs including pre-paid funeral plans and cremation services. If you have any questions about how we may serve you, please call us at 361-645-1104 or visit us at our new facility located at 414 W. Ward, Goliad, Tx. 77963. Our caring Staff looks forward to the privilege of serving you. "Surely beauty and wonderment await me at the end of this path called..."